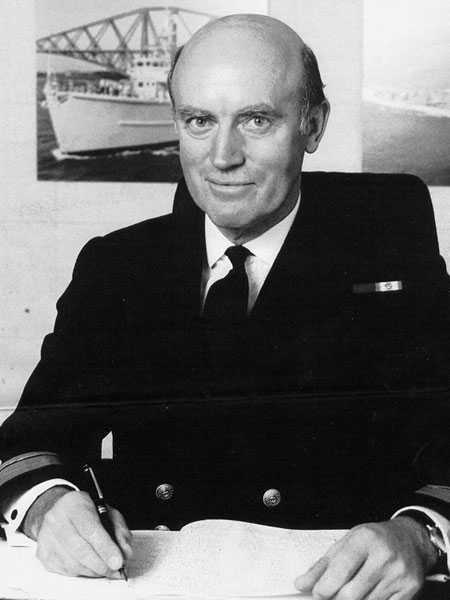 Neil Wilkinson's life aboard the HMS Intrepid in the Falklands / Malvinas War 1982. 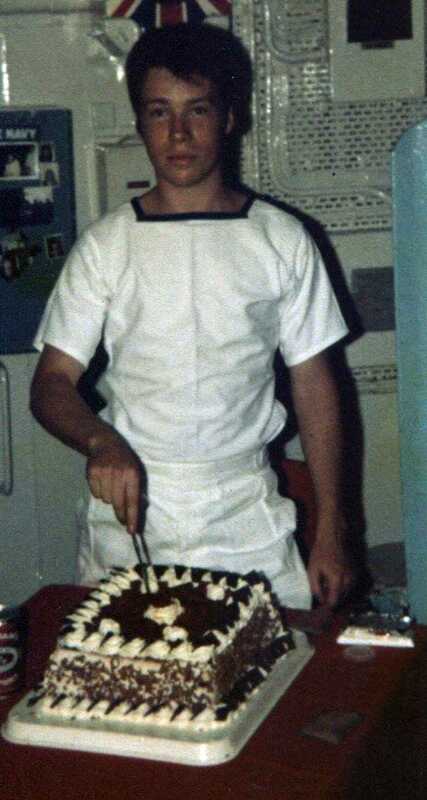 The picture of myself cutting the cake was my 21st birthday, we were in Cyprus, that's the only bit I remember of the day, the rest is a blur due to excessive amount of beer I drunk!! haha. That's when I had hair too.. 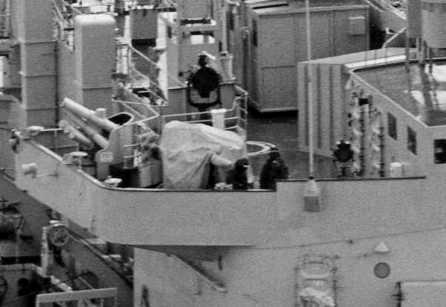 I think one of the most heart breaking sights for me, was sitting in my gun watching HMS Antelope explode! That then brought it all home to us and it was a very tearful moment, watching one of your own ships explode, when hours earlier it had sailed past us. We lost many ships and many good men, but so did they too. War is not just about two or three nations going on a battle field and killing each other, people seem to forget the aftermath and the people who have lost loved ones, the younger generation (although taught it in schools) don't fully appreciate what the armed forces of the world achieve. Let me know where the article goes as I can then tag it and see it regularly, if you don`t mind? 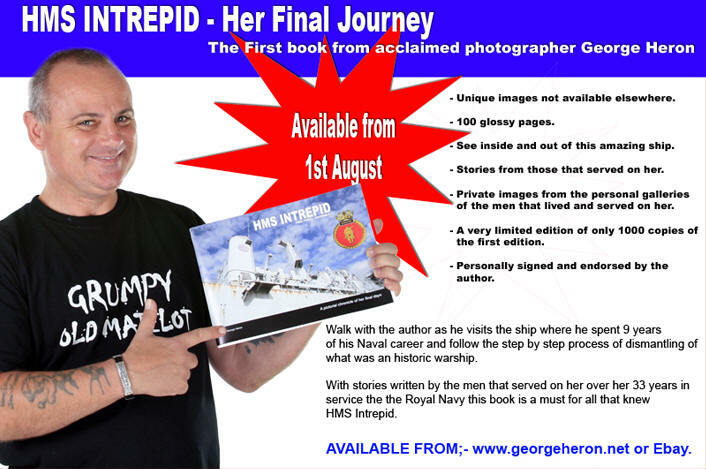 I had a call from my old Captain tonight, his book is now going to a publishers, the release date isn`t set yet but it will be soon, I will be at the book launch and I will get you that signed copy. He reminded me of a few things that could have gone terribly wrong if our fate had being different. 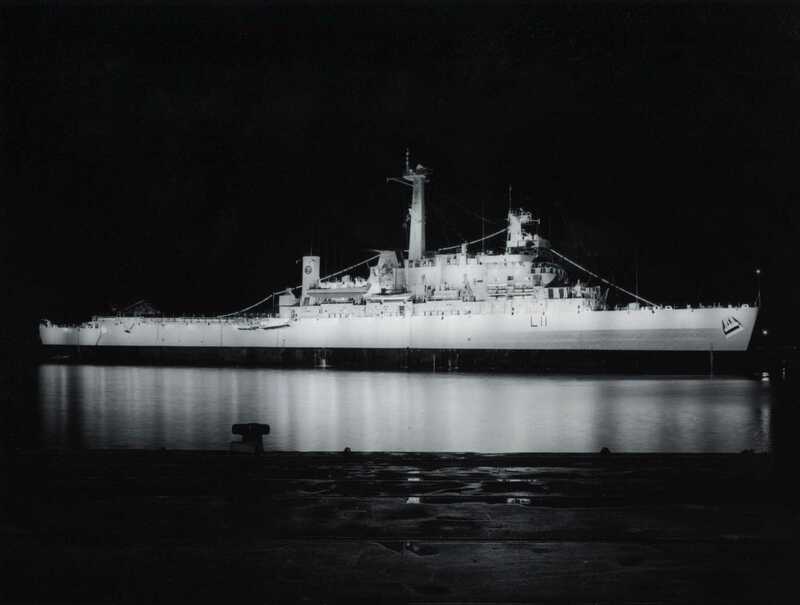 One of them was when the ship must have got hit by a bomb in San Carlos bay that hit the side and bounced off us. 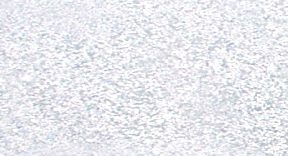 The other story was more bizarre, an SAS guy had put his washing into the laundry but when the machine was going round, a clunking sound could be heard! When they opened the door they found two hand grenades in with the washing, the SAS guy had forgotten to empty his pockets. That made me laugh, the elite guys nearly blowing our laundry up, now that would have being a story. Thank you for your kind words and advice/suggestions. There is a special bond between our veterans, and with most of us still being quite young, we have a lot to offer and are making headway with our projects as you know. All the projects have been the idea of the individual concerned, but each has a common theme. That is to pay tribute to our old ship and explain as best we can about our experiences, when we were young men. The talent and thrust, for want of a better phrase has laid dormant for most of us for 20 years or more, but since the "Old Boy's" got back together, something happened. I think in our circumstance it was the witness of the Intrepid being towed out from Portsmouth and her subsequent dismantling of her in Liverpool , our unique opportunity to visit our old home one last time. Also the fact our Commanding Officer from the '82 Falkland's Campaign is in not very good health . These are factors which helped us get back "Onboard" , plus the new technology, that is the Internet have made communication so easy. All this would not have happened had it not been for two of our boy's Rab Carrigan and Mike Fleming not exchanged cards at the Falklands 25 Parade two years ago. Regard's to the Play, I would be very happy with you supporting the publicity for it. I am minded to put it on my own website when I am ready to launch a site. However, I will send you information on it at every stage. The timetable is that I will perform it at a small local venue next June, that's assuming I can get the cast!, but I have booked the Hall anyway!. That is only the start, for I want to share the story with as many as possible, because Neil Wilkinson's and Mario's tale will strike a chord with many. In essence, it is about the small things of life onboard a warship, still much a mystery to the public, and about personal struggle, about our own insecurity, the sense of humour and ultimately about reconciliation from both sides of the conflict. A War may last only a short time, but it's effects on those it touches can last a life time. The Intrepid was around 12,500 tons when fully loaded with troops and tanks. 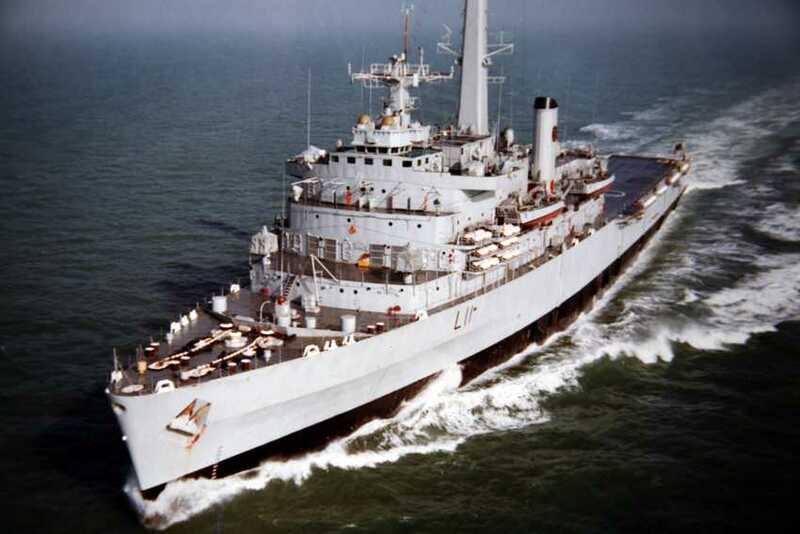 On the night of 19th May 1982, this was to be a very sad evening indeed onboard HMS Intrepid. That night I was on watch on the bridge, it wasn't a particularly nice night weather wise, but it never was in the South Atlantic, the waves were massive and the ships ploughed into the swell. The Intrepid was sailing southwards and we were cross decking troops from the Hermes. 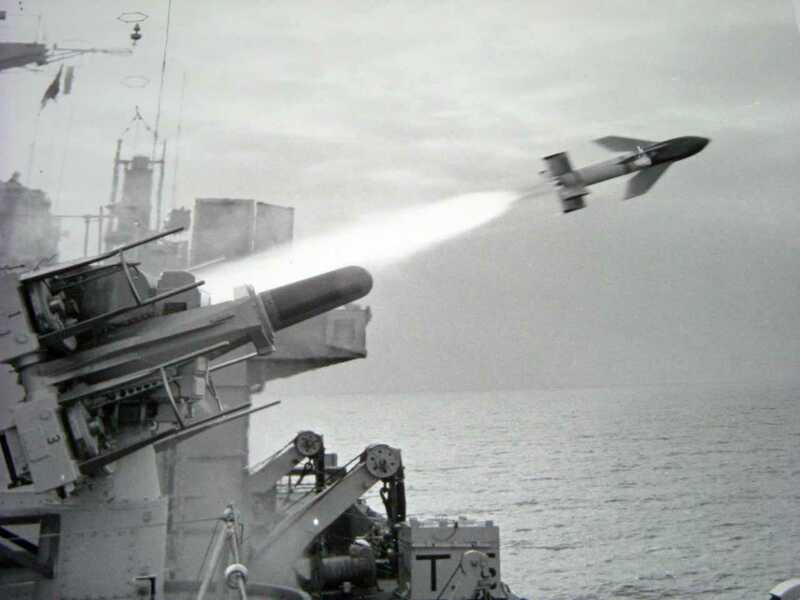 It is thought that while crossdecking a Seeking helicopter from Hermes hit an Albatross, causing the helo to ditch into the dark waters of the South Atlantic. All attempts were made to try and recover/rescue any survivors from the helo, sadly we lost 18 SAS men that night, 22 men in total, 9 survivors were miraculously pulled out of the icy water. 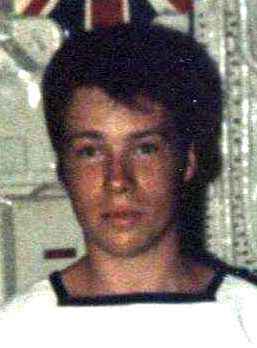 I remember I was stood on the bridge wing, we had spot lights trained on the water searching for anything. It was indeed a very sad night. 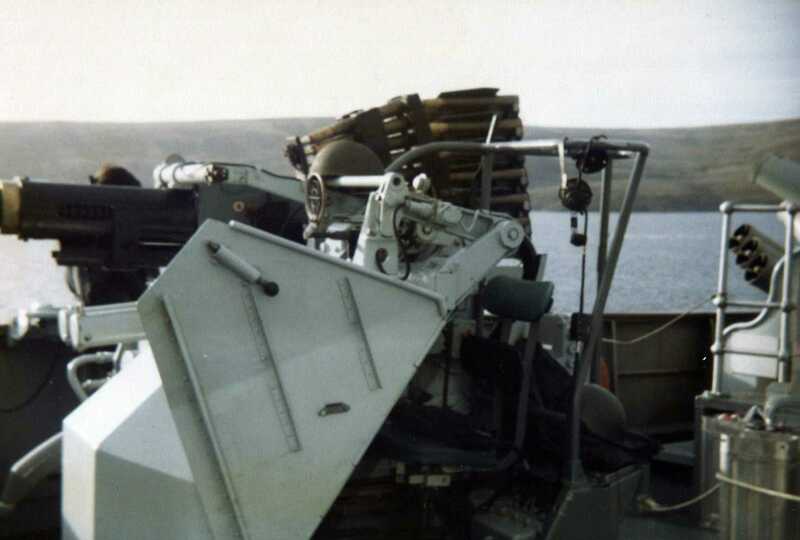 My Bofors gun onboard HMS Intrepid. 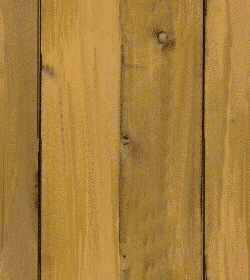 I was on the starboard side, but they were very similar in appearance. I'm not sure when it was fired though. 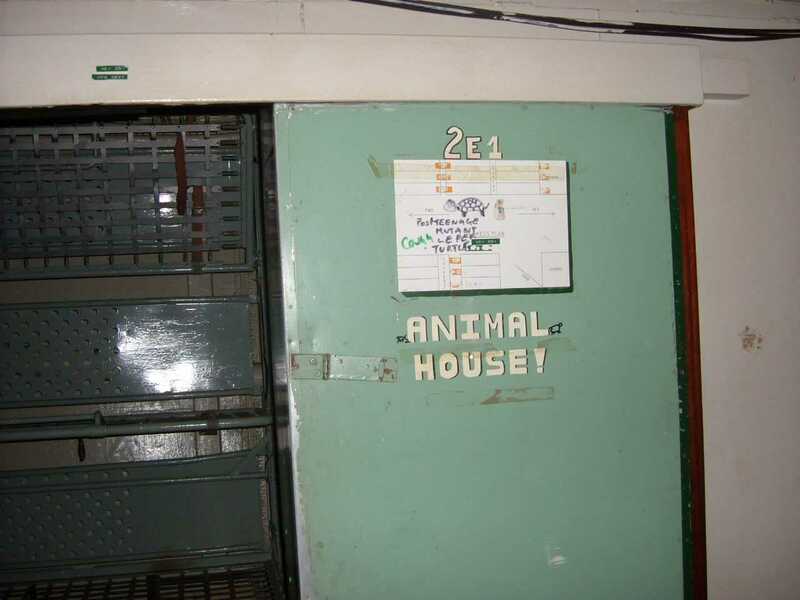 Handwritten on the door is "Post Teenage Ninja Mutant Turtle"
This was the entrance to the locker where Neil slept between attacks. 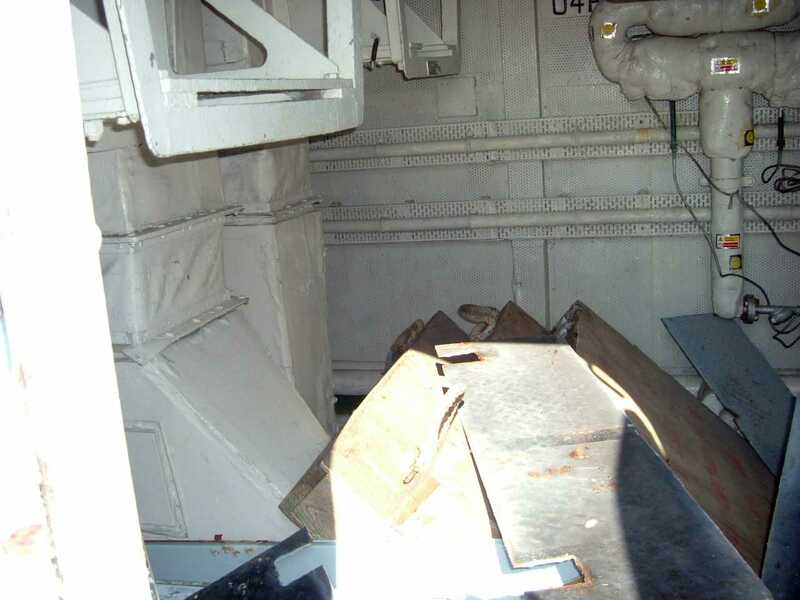 This is where I spent time after the we were allowed to rest after the first day of attacks, it was a locker on the upper deck, not too far away from my gun. In this small room, I wrote a letter home to my mum and family and eventually fell asleep for which seemed like an eternity, but was probably only a few hours, I was eventually woken up and then waited for the Argentines to attack again, they never disappointed us and always turned up! 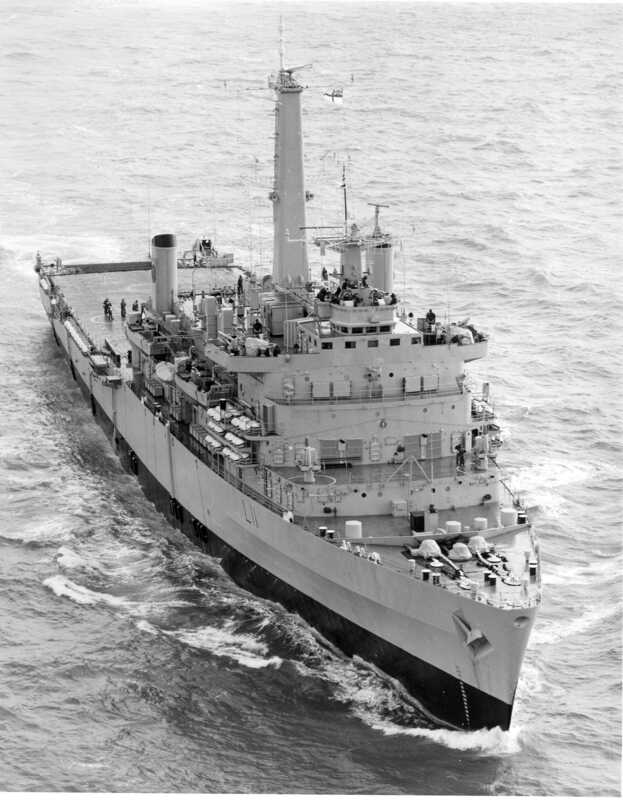 Battle Story of the Falkland Islands War. Back in the Falklands and in every war your training and expertise takes you to another level. Although you are an individual, you have a massive team around you, from medics to chefs, gunners to signal men. My job onboard intrepid was to protect that team. I lost sight of this fact and was reminded of it some years ago by an ex SAS member, thanks to him I started on my road to understanding me. 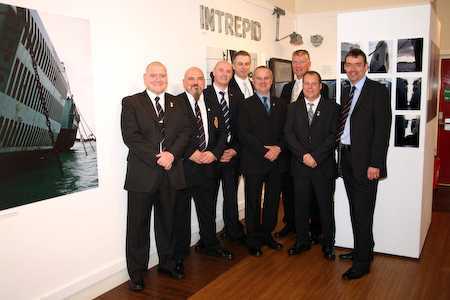 The veterans who attended the book launch, please note the exhibits in the background. Neil Wilkinson our starboard gunner in the conflict is 2nd from the right. I (Mike Quinn - that's me- is on the 4th from the right at the back). Pictured in Fareham Creek the next morning where we gathered to see our old ship Intrepid, many of us for the first time in 25 years. 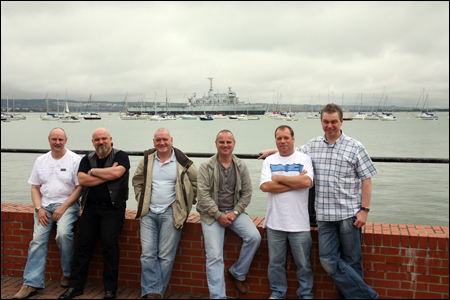 The veterans are from the left, Steve Dickinson, Rab Carrigan, Russell Morgan, George Heron, Neil Wilkinson and Mike Quinn. 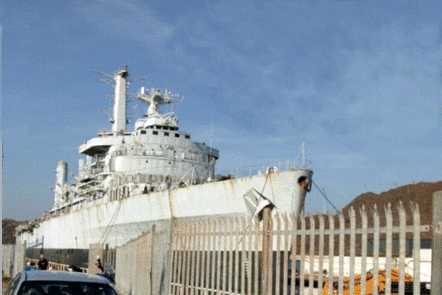 The Intrepid's final destination in Liverpool, in September 2008, where she is being dismantled for recycling, and is contracted by the owners Leavesley International. 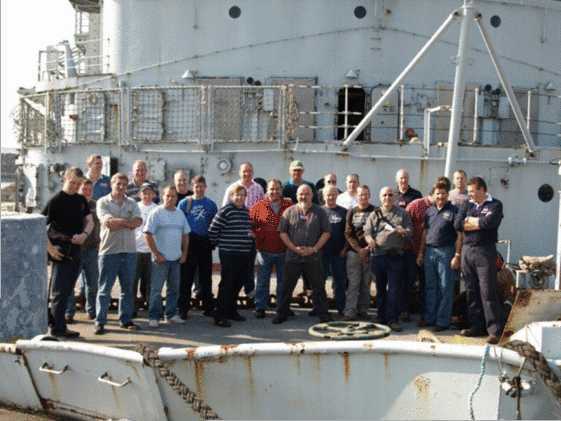 The Leavesley company were very kind in allowing up 40 of our veterans to gather for a final goodbye to HMS Intrepid, our former home 25 years earlier. We had a fantastic day exploring our old ship whilst the memories came flooding back. 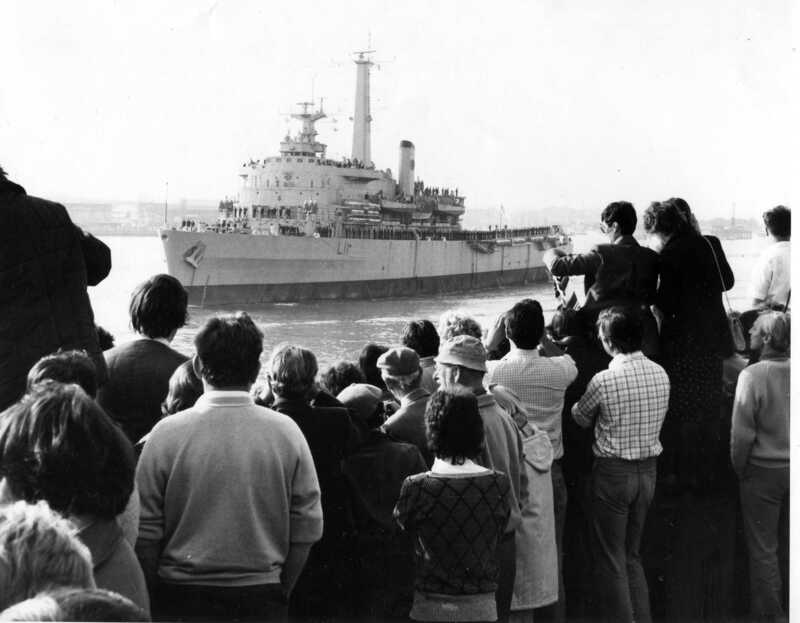 The Leavesley company were very kind in allowing up 40 of our veterans to gather for a final goodbye to HMS Intrepid, our former home 25 years earlier. We had a fantastic day exploring our old ship whilst the memories came flooding back. 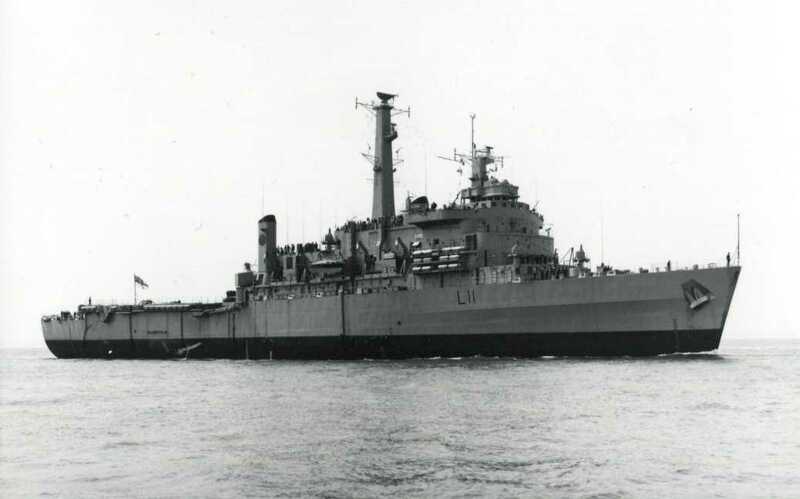 What have the sailors done after the Falklands War? 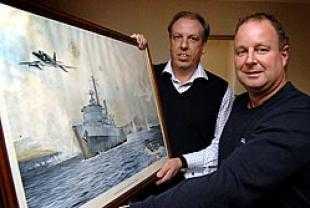 Please find attached a picture I have lifted off our site, donated by "Pusser Hill", it is of a painting done by one of our Officers in '82, of HMS INTREPID under attack. 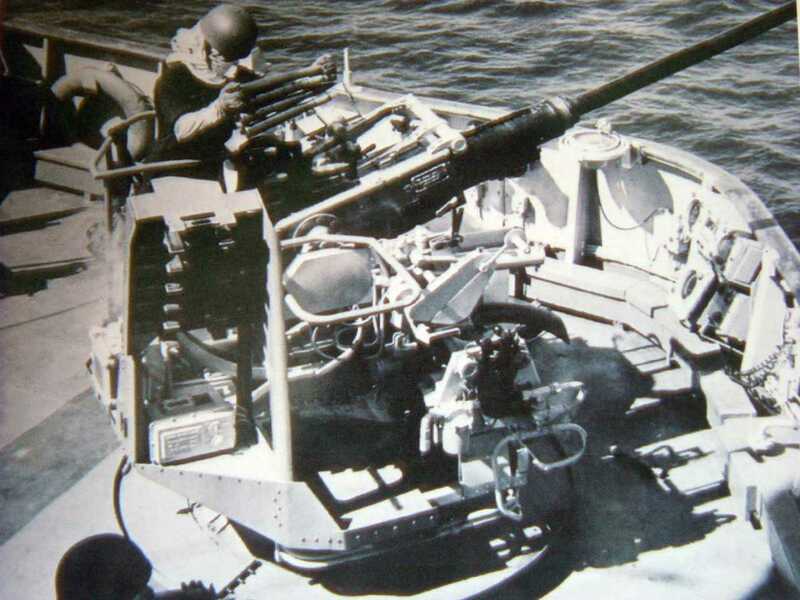 The picture depicts day 4, and our friend Neil's gun is firing at the aircraft on the starboard bridge wing. We are seeking who can supply a copy or copies of this and such artwork, hope we can get hold of one. Also, are there any Veterans with Pearl Harbor veterans, or Navy veterans involved in air battles with ships that would like to share their stories? If so please send them to the Webmaster. What's Coming? A New Movie "Enemy Contact"